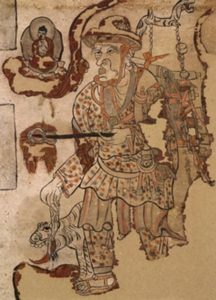 A painting of an itinerant storyteller, late 9th century, Dunhuang, Cave 17. The spread of Chinese Chan Buddhism to Tibet between the 8th and 11th centuries occured (almost) unnoticed in classical Chinese sources and is, in fact, still mostly unnoticed in current sinological scholarship. However, for the formative time of Buddhism in Imperial Tibet the socalled Debate of Samye in the 8th century, where a Chinese and an Indian proponent supposedly have argued about the true Buddhist teachings, had far-reaching consequences for the choice of transmission of Buddhist teachings and for centuries to come for the respection of Chinese Buddhism in general. The presentation will give an overview of the transfer processes of Chan Buddhism to Tibet, including the debate of Samye, the spread of Chan Buddhism and its reception history in Tibet and thereby move beyond modern disciplinary boundaries.